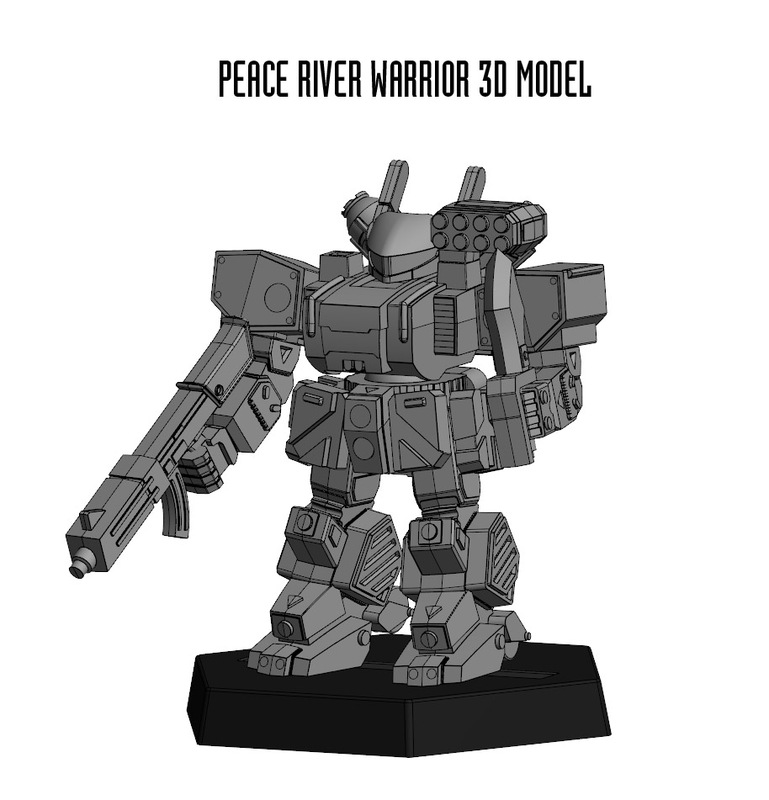 Dream Pod 9: Peace River Plastic Model Sprues Preview Shown To Scale! Our 3d modeler finished the Kickstarter's Peace River plastic model spues for the Warrior, Warrior IV, Skirmisher, and Crusader IV last week. Checkout the preview image shown below with all four model sprues shown to scale and with rulers in millimeters (mm). We managed to fit all of the models stock and variant weapon parts on the sprues, along with extra pose lower arms and legs in most cases. Plus extra parts like hand grenades, ammo clip, and boxes to add around the hips like our original pewter models have. Ball sockets connect most of the parts allowing you to glue together the model in a wide variety of poses. Lower Arms are separate parts that can be rotated in or away from the torso and glued in the desired pose. One cool feature of the Solidworks 3d software is the ability to save the parts and assembly views as 3d PDFs. 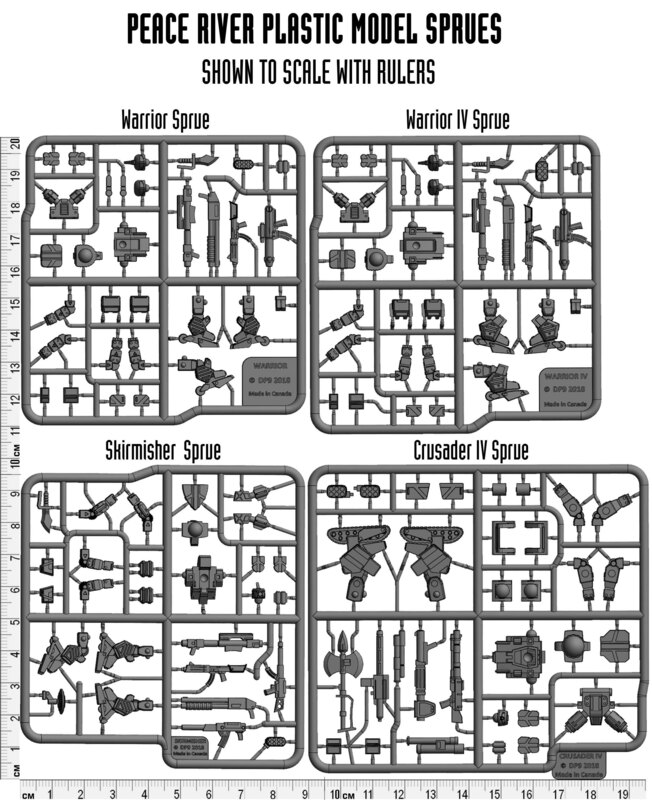 Here is a link to download a 3d PDF (4.6MB) of the Warrior model parts sprue. Once on the download page, you will need to right click on your mouse for the option to save the file or you may have a download button at the top right of the screen to click, as 3d PDFs won't open automatically online. And you will need Adobe Acrobat Reader DC for PC or MAC, here is a link to its download/install page. Once you have the filed downloaded to your computer and open it using Adobe Acrobat Reader DC and you'll be able to zoom in, rotate the sprue, and see all the details up close. The sprue makes a single Warrior stock model shown below and also includes all the variant weapons and extra parts. Our modeler is now working on the NuCoal model sprues and has finished up the Cuirassier so far, once he has all four model sprues done we'll get another preview update done to show you all how they look. Then he'll be doing the Utopia model sprues and once finished we'll be able to get production started on all the plastic injection molds. Home › Blogs › Robert Dubois's blog › Peace River Plastic Model Sprues Preview Shown To Scale!